Mr Madge studied medicine at Jesus College, Cambridge, graduating with a double first class degree in Medicine and Experimental Psychology in 1994, before studying clinical medicine at Magdalen College, Oxford University. After initially training in general internal medicine and gaining Membership of the Royal College of Physicians, he then started specialist training in Ophthalmology. After working in Bath and Nottingham, he completed his Higher Surgical Specialist Training on the Peninsular Rotation (Devon), gaining Fellowship of the Royal College of Ophthalmologists in 2007. He has undertaken two Fellowships in Oculoplastic, Lacrimal and Orbital Surgery: (i) with Mr VT Thaller at the Plymouth Royal Eye Infirmary and (ii) with Professor Dinesh Selva, Dr Garry Davis & Dr James Muecke at the Royal Adelaide Hospital, Adelaide, Australia, widely regarded as one of the best training opportunities in this field in the world. Oculoplastic surgery refers to plastic surgery performed in the region around the eyes, encompassing both aesthetic surgery (e.g. eyelid reshaping or blepharoplasty) and reconstructive techniques. Mr Madge is a member of the British Oculoplastic Surgery Society, the national body which promotes excellence in training, research and clinical practice in the field of aesthetic and functional eyelid surgery. He has recently pioneered the introduction of injectable intraocular lens technology for cataract surgery to the Nuffield Health Hereford Hospital, with consequent smaller incision cataract surgery and many potential benefits for his patients. One major advantage of having cataract surgery privately is the ability to choose the type of lens that is implanted. A modern, state-of-the-art multifocal lens typically allows patients the ability to see clearly into the distance and also to read without the need for spectacles, effectively restoring youthful sight. Some patients even choose to have multifocal lens surgery before significant cataract develops, purely to rid themselves of reading glasses. Bespoke toric lenses can reduce pre-existing astigmatism in an eye, greatly increasing the chance of not needing glasses after surgery. Such special lenses are not normally available within the NHS setting. I recently had Refractive Lens Exchange surgery at the Hereford Nuffield Hospital. The procedure, for multi focal lenses in my case, was carried out by Mr Simon Madge. The outcome has exceeded all my expectations; my near and distance vision are both excellent and I have no need of my glasses at all. The whole experience was far less scary than I had anticipated and everyone at the hospital was unfailingly pleasant and helpful. Mr Madge was kind and reassuring throughout and I had complete confidence in him from the outset. I could not have wished for a better result. Thank you and Mr Madge for everything. Keller Prize, for an outstanding academic record at Jesus College, Cambridge University, 1991-4. Patrick Mallam Memorial Prize in Clinical Medicine, Oxford University, 1997. Elizabeth Hunt Medal, Part II of the Membership of the Royal College of Ophthalmologists Examinations, 2003. Royal College of Ophthalmologists Pfizer Ophthalmic Fellowship Award, 2007-8. Mr Madge is married with two daughters and enjoys walking, running and golfing in the beautiful Herefordshire countryside. 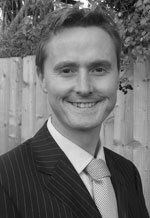 Mr Madge has published numerous scientific papers in peer-reviewed journals on matters pertaining to both general ophthalmology and oculoplastic surgery, and continues to have active research interests despite a large clinical workload based at the County Hospital, Hereford. A continuously updated list of Mr Madge’s peer-reviewed publications can be found at www.pubmed.com . He is also the lead author of 2 successful ophthalmic textbooks, including Clinical Techniques in Ophthalmology. Mr Simon Madge does not hold a share or financial interest in this hospital, another Nuffield Health hospital or the company. Mr Simon Madge does not have a share or financial interest in equipment used at this hospital or another Nuffield Health hospital. Mr Simon Madge does not hold any paid advisory role(s) at this hospital or on behalf of Nuffield Health.